UNIQUE TRANSPORT SOLUTION: Switching working to transport is fast and easy. The TE6576CD's transport wheels fold hydraulically toward the center of the machine, providing a low center of gravity for improved balance. When it’s time to transport the TE8511C to the next field, the outer rotors are folded forward onto a carrier frame. The carrier frame allows the tedder to move forward quickly and easily from one field to another. STRONG CHASSIS DESIGN: All Kubota tedders are built around a rugged, CNC bend, box chassis made out of one piece of metal with only one welding seam for maximum rigidity. The chassis design is fully enclosed at the top edge for maximum strength. 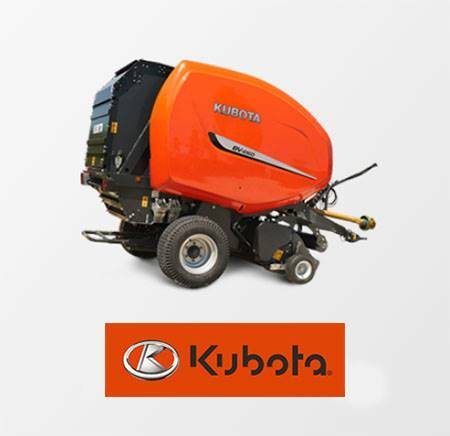 ROTOR GEARBOX: These Kubota tedder models have a maintenance-free, oil-immersed gearbox, which means less time required for servicing and more time in the field. The gearboxes are integrated into the frame, making them extremely durable. Because they are not part of the frame structure, but are mounted within the actual frame, the gearbox is relieved of frame stresses. 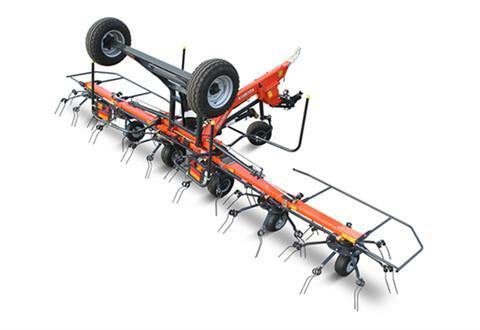 SUPER-C TINE: The symmetric Kubota Super-C tines efficiently pick up the crop from two different areas. As it spreads the crop, the crop is inverted so the lower crop is placed on the top, giving a more even dry down. The crop is then spread evenly across the width of the machine for consistent drying. These tines are made of 0.39" shot-peened spring steel. Our spring coil diameter has a 20% larger diameter than conventional designs. This increases each tine service life, even when tedding heavy, high moisture crops. HIGH PERFORMANCE, LOW INPUT: The TE6576CD and TE8511C offer working widths of 24 ft. 11 in. and 36 ft. 1 in. respectively. With a pull type drawbar on the TE6576CD and a 2-pt hitch on the TE8511C, they are easy to attach to your tractor. They are still ideal for low horsepower tractors due to their trailed design, which minimizes compaction and operating cost. Working Position - 37 ft. 1 in.